Coming from TechSmith, one of the indisputable authorities in screencasting software, Jing is specifically designed for creating and sharing short videos quickly and easily. Using Jing you can create videos up to 5 minutes in length, and is tightly integrated with video hosting site screencast.com (also from TechSmith). Sharing videos is just as easy as recording, just upload to screencast.com using the recorder, and paste the link into an e-mail, instant message, or anywhere. This is my personal tool of choice for quick screencasts that I frequently use as a tool for providing support. As an added bonus, Jing also doubles as a still-image screen capture tool. A relative newcomer to the screencasting arena, GoView comes from Citrix, makers of the popular online meeting product GoToMeeting. 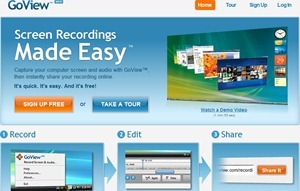 Videos you create using GoView are automatically uploaded to the GoView website as you record them. When you’re done recording, the video can be shared by clicking a Share This Recording button on the GoView website. Unlike Jing, GoView features an incredibly handy editor. Using it you make some basic edits to your recordings; cutting out unwanted parts of your video and adding basic titles. The big advantage ScreenToaster has over the other tools in this post is what it lacks; an installer. ScreenToaster is a great anytime, anywhere screencasting solution. There’s no need to install a client application, just go to the website using your favorite internet browser, and press record. When you’re done, you can use the ScreenToaster website to upload the video to their own site, YouTube, or even download to your own computer. For a no frills solution to creating screencasts of any length, CamStudio just may be the solution for you. 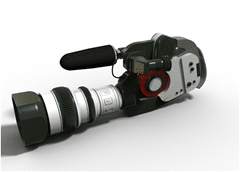 Its small footprint makes it a great choice for recording to AVI or SWF (flash) formats, however without a built-in editor; it’s far from a total solution to your screencasting needs. Still, if you don’t mind using something like Windows Movie Maker to do your edits, you can certainly use CamStudio to create impressive screencasts. The long-time standard for serious screencasters has been Camtasia Studio, and for good reason. Camtasia Studio can encode to a wide variety of formats, allows you to do things like highlight your cursor and your cursor clicks, and more. Regardless if you’re recording a quick one-minute tip, or an entire training class, Camtasia Studio is up for the job. Once you’ve recorded your screencast, Camtasia lets you bring your recording into its editor where you can dramatically refine your recordings. Using the editor you can cut out portions of the recording, add annotations, zoom & pan, even make basic audio edits. For an easy to use, all-in-one solution, Camtasia is packed with features allowing it to rise to nearly any screencasting occasion. This is my personal choice for creating longer screencasts (for under 5 minutes, I use the above-mentioned Jing Pro product).